October » 2014 » Harrumph! He knew your name. Like the obverse of the Cheers theme, he knew everybody’s name. Mayor Tom Menino internalized the number one rule for successful populist politicians — he remembered you, your face and your name. Like so many thousands of Bostonians, I was personal with Da Mare. He made it easy. The pic here is from one of the numerous neighborhood coffees I attended. He loved handing out pots of marigolds and salvia from the city greenhouses. Moreover in our shared Hyde Park, he seemed to know all and each of us. He’d ask specifically about spouses, children and grandchildren. He cared, enough to pay attention and remember. He also was avuncular beyond his age…everybody’s uncle. I’m pretty sure it wasn’t HP specific, but I noticed a parallel pair of “kid” allusions in a short period. One involved then City Councilor Rob Consalvo, who was stepping down to run to replace Menino who had announced he would not go for a sixth term. 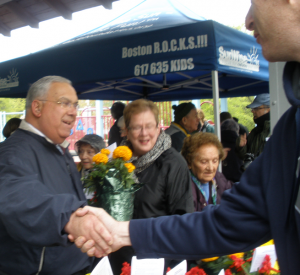 The Mayor was Rob’s mentor and Rob took over the district seat Menino held when he was elevated to the top spot in 1993. One evening during the campaign I got a call and was Surprised to hear a campaigner say she was Rob Consalvo’s mother and wanted me to vote for him in the preliminary. Yup, she was phone banking. Then one of the times I chatted with Menino at a local restaurant opening (he always did his bit for Boston businesses), I mentioned that I lived two houses from Dan Linskey on Fairmount Hill. I knew that the man who became face of Boston Police following the Marathon bombings had been the Mayor’s driver for years. He became the number one uniformed officer, number two in the department after the commissioner, with the impressive title Superintendent in Chief. Like Consalvo, Linskey is a grown man, replete with wife and kids, college age in his case. Menino might barely have been old enough, in the stereotypical hillbilly sense, to be Linskey’s father. Uncle was more apt. He loved that role and was great at it. Definitely on my to-do list and almost as surely not on his, I wanted that promised bike ride from Hyde Park to City Hall, maybe with Steve Murphy too. It would be the old guys cycling to town. Like so many in Boston, I knew Thomas Michael Menino. He died this morning at only 71 from cancer. He must be the most loved person in town. Among the many things he did to earn that affection was meeting and knowing so many of us. I’ll surely post a few vignettes. Today it’s a bicycling story. As a blogger and podcaster, I commented about him and to him. He allegedly was prickly and overly sensitive to criticism, but I never experienced that. He was a guest on my Left Ahead show several times, like here. I’d see and chat with him at political, cycling and similar events at City Hall, at restaurant openings and tree lightings in our Hyde Park neighborhood, and of course annually at his July 12th block party to celebrate his ascendancy to acting mayor in 1993 when Ray Flynn flew away to the Vatican. As it turned out, long-term City Council member and president from 2011 into 2014 Steve Murphy also lives in Hyde Park, jut a couple of blocks from me on Fairmount Hill. I asked him whether he biked. He said he had a mountain bike and would be up for riding to City Hall if I’d arrange it. Menino too was passively accepting of the concept. Before he broke an ankle bone and had other health troubles, he had a two-wheel epiphany. Like so may locals, he had been hostile to bikes but got one as a gift from a City Councillor and thought about the pluses of cycling. He rode around HP and in the gym. He hired that bike czarina and actively championed her good road work. He is a hero to cyclists. Inariably when we’d meet, I’d talk cycling too and began to ask about when the the old guys (in fairness to Steve, I”ll note that he’s about a decade younger than I) could spin into town. The first couple of times he’d say that I’d be too fast for him, but I said we’d all ride together and it was really only about 10 miles. He joked that Murphy would have a heart attack in the effort but that we’d do the trip as soon as he was healthy enough. Well, I kept checking but he never got healthy enough. He had lung and gut problems and then a diagnosis of advanced cancer from some unknown source. I would have enjoyed that ride and suspect he would have too. Most of the funding for the effort comes from the United Way and LISC (Local Initiatives Support Corporation). Boston isn’t the first to get one of these. Locally Lynn, Lawrence and Chelsea already have the the program should open a total of 10 here. Cities in other states have theirs working. What caught my attention most though was Walsh’s comments about growing our static burg. We’ve hovered around 600,000 for several decades, recently edging up to maybe 636.000. Note that 60 years ago, the population was above 800,000. Walsh would like to see the actual city above 700.000. He said today that a big factor there would be providing more and more affordable housing. That would be 50,000 to 60.000 units to support the growth. It’s no coincidence that a couple of candidates whom Walsh defeated in his mayoral run proposed similar goals and figures. The fascinating part of today’s gathering was that he has not backed away from the goal. I’ll try to get him to come on Left Ahead again to detail his plans. You are currently browsing the Harrumph! blog archives for October, 2014.